In case you already have ZNC installed, I suggest you remove it and do a clean install. 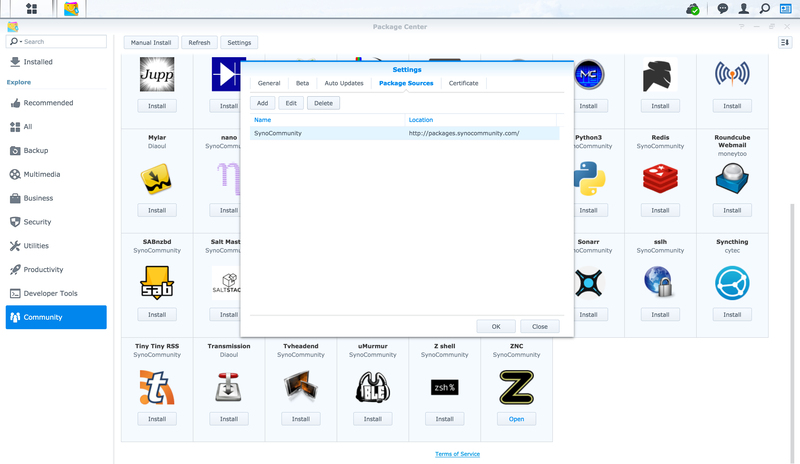 Mainly due to some problems with package in past, where ZNC wouldn’t start automatically on boot which lead to creating projects like: synology-znc-autostart. In latest version, all of these problems have been fixed and couple of new features have been added. As part of installation process, ZNC config will be run with most sane/useful options and admin user will be created allowing you access to ZNC webadmin. 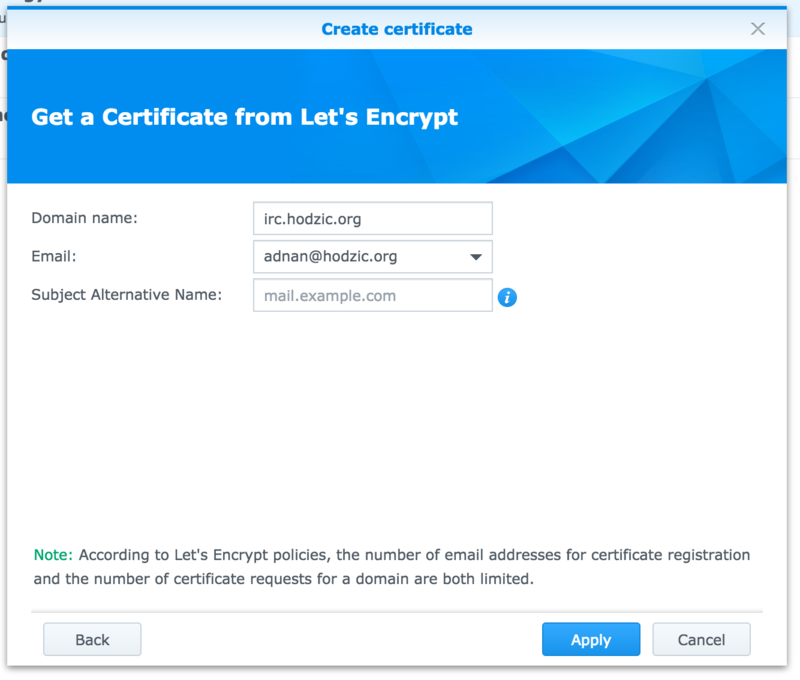 Now we want to bind our sub/domain created in “Step 1” to ZNC webadmin, and secure external access to it. 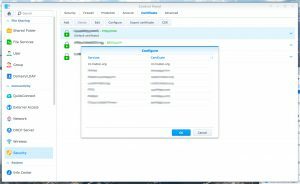 This can be done by creating a reverse proxy. In this case, we can see it’s 8251. 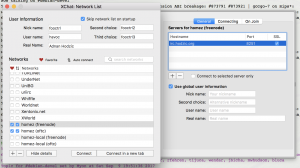 As part of this step, in ZNC webadmin I’d advise you to create IRC servers and chatrooms you would like to connect to later. In this example I’ll use XChat Azure on MacOS, and same procedure should be identical for HexChat/XChat clients on any other platform. 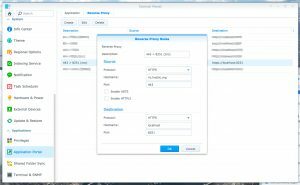 Altough all information is picked up from ZNC itself, user details will need to be filled in. 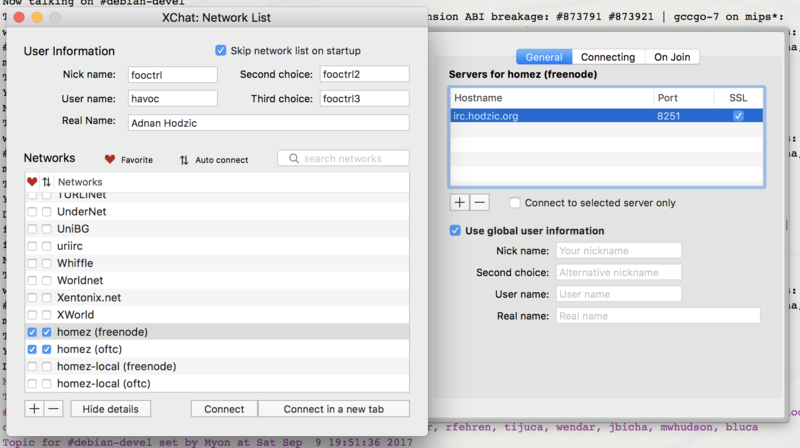 In my setup I automatically connect to freenode and oftc networks, so I created two for local network and two for external network usage, later is the one we’re concentrating on. 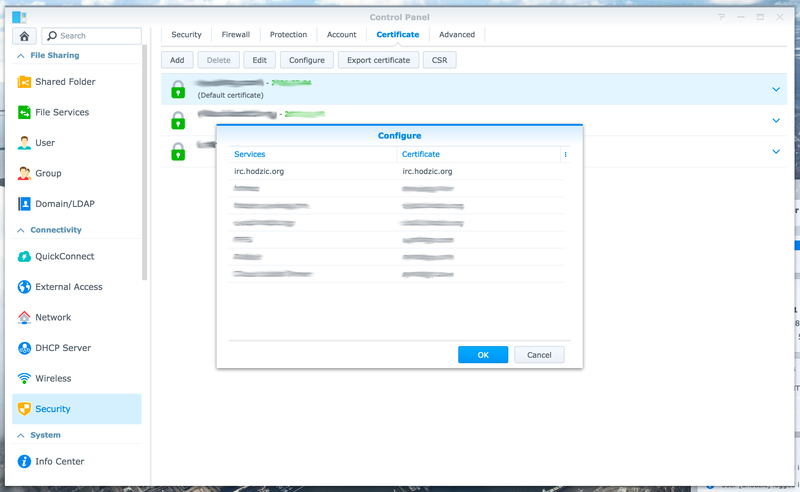 On “General” tab of our newly created server, hostname for our server should be the sub/domain we’ve setup as part of “Step 1”, and port number should be the one we defined in “Step 4”, SSL checkbox must be checked. 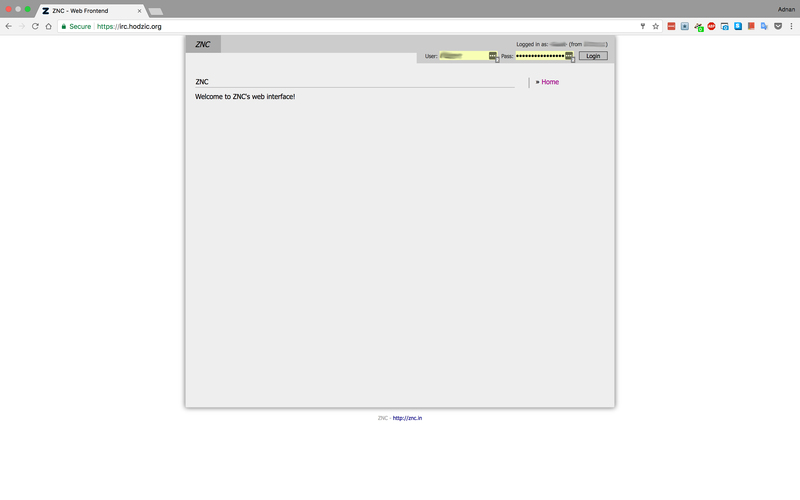 Where, “johndoe” is ZNC username. 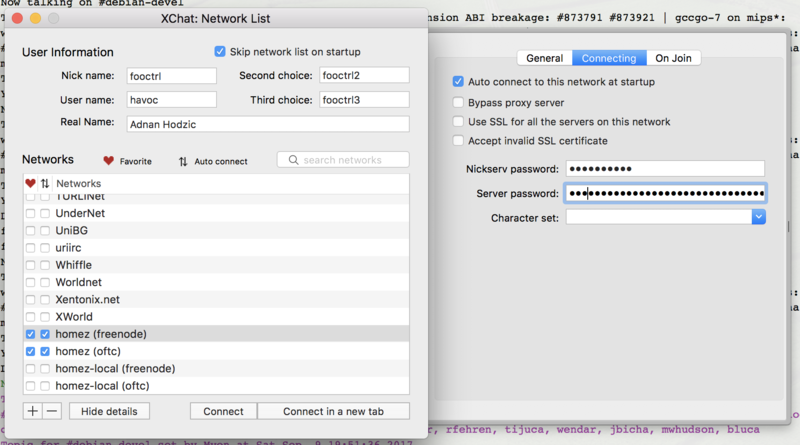 “freenode” is ZNC network name, and “password” is ZNC password. “freenode” in this case must first be created as part of ZNC webadmin configuration, mentioned in “step 4”. Same case is for oftc network configuration. 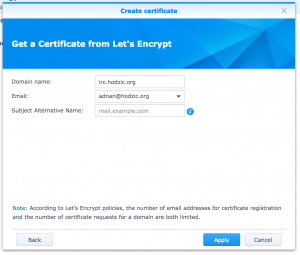 As part of establishing the connection, information about our Let’s Encrypt certificate will be displayed, after which connection will be established and you’ll be automatically logged into all chatrooms.